Press & Glow Spinner is rated 4.5 out of 5 by 26. With just one push upon this star, your baby’s wish is sure to come true! Watch the magic begin as things spin and sparkle inside the Bright Starts Press and Glow Spinner. She’ll ooh and aah and ha-ha over the incredible lightshow that dances around the room. 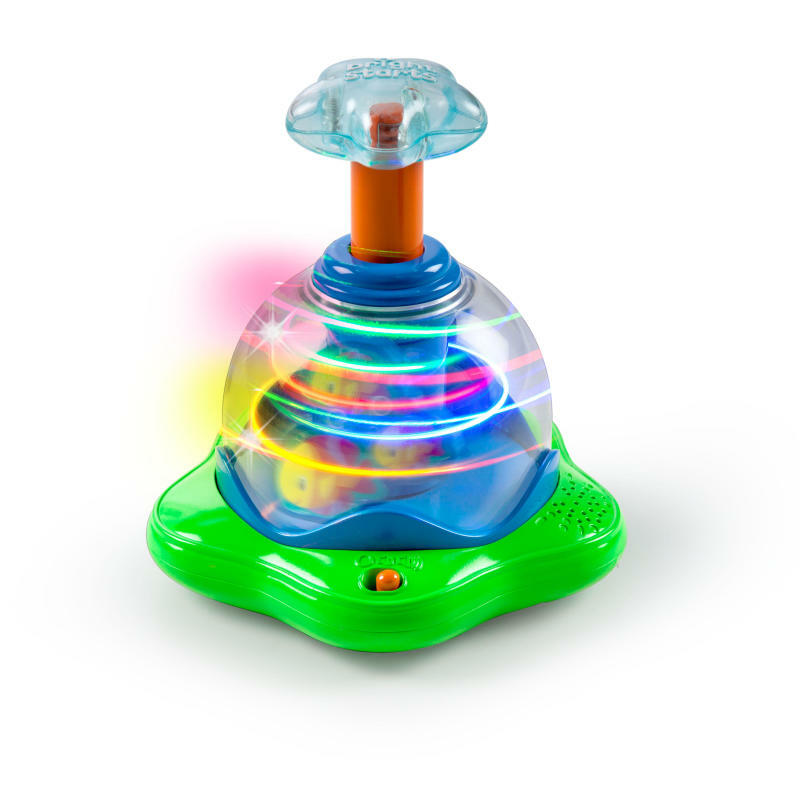 This toddler toy will have your little one wondering which song will play next when she presses down again and again. With her magic touch, she’ll make things go and glow! Your baby is the star of this lightshow! Dimension (in) 6.5" x 6.7" x 7.25"
Rated 5 out of 5 by GrantsMom from Very engaged child This toy was not only fun for my son who was 1.5, but also my nieghbors 6 month old, and her 3 year old son. The lights are very cool and also is the engagement. Rated 2 out of 5 by ATL008 from Not our favorite toy. Lights too bright! The product has lots of bright colors and fun music; however, I only let my baby play with it while the power is off because the lights are far too bright. After looking at the lights, I was seeing spots for quite some time as if someone had taken several photos of me with a camera flash. The spinner also only has one function really: push and watch spin which only holds the little one's attention for a few times really. So all in all, my little one can't really take full advantage of the product's features because the lights are too strong to play with it turned on and it is not the most engaging toy. Rated 4 out of 5 by Allie from Great distraction I purchased this toy when my daughter was 5 months old. She showed very little interest in it at first. It would attract her attention when we would press down on the top and make it spin quickly, but she would lose interest and didn't interact with it on her own. My how a month has changed things. My daughter is now army style crawling and knows what this toy can do. She will crawl over to it and push the top down. She seems to really like the colors and the music. She also likes to try to chew on it (we're in that stage!). There are no sharp edges so I feel safe letting her gnaw on the edges. It's also great when she is crawling towards something she shouldn't be playing with (a lamp cord) and I need to get her attention back to me. Rated 5 out of 5 by Hailey Chung from Great spinner for babies My son loves it! It spins very fast and is easy to push. Great size for little hands and it has balls inside and it lights on like disco ball when it spins. Fun fun fun! Rated 5 out of 5 by Augymnast from Fun toy This toy was fun! Even my older daughter likes to play with it. It lights up when pushing the top and spins and plays music. My girls actually play with this toy.